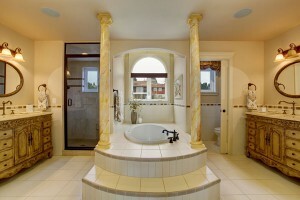 Your bathroom is an essential area in the home; it’s meant to enhance your convenience and comfort. However, as we all know, this space in the home is often prone to much filth and aging. And when that happens, you need an expert design and remodeling company to design and remodel the space in a way that excites. Modern Painting & Remodeling is the company to trust. We offer homeowners a wide range of premier bathroom solutions that improve the appeal and value of their homes. These include bathroom designing, bathroom remodeling as well as bathroom renovation. Our bathroom designers are creative with hands-on experience and deep knowledge working in this field. They give you not only your bath’s desired look, but also a superb bathroom design that ensures perfect functionality and enjoyment for many years to come. Whether you are looking for the more luxurious and detailed bathroom space or just a sleek bathroom design, Modern Painting & Remodeling is sure to deliver a fine bespoke touch of excellence. With expertise and a keen eye to detail, our remodelers provide our clients with a broad array of bathroom remodeling services which range from the initial bathroom design, bathroom renovation to other specific service options such as bathroom fixtures, bathroom tiling & flooring, bathroom tubs, bathroom vanities, shower and sink installations, interior lighting, bathroom tile designs, and more. So whatever your bathroom renovation, design or remodeling needs, count on Modern Painting & Remodeling to provide you with top level customer service and expert craftsmanship. Are you in New Haven County or Fairfield County in Connecticut and in need of reliable bathroom remodel services? Are you looking for bathroom renovation services in Greenwich, Westport, Darien, or bathroom design services in Easton, Hamden, Clinton, and even areas further over into New London, CT? Ready to replace that aging commode with more stylish elements? Enjoy a perfect bathroom space accentuated with sleek pieces from our all-inclusive range which includes faucets, towel bars, accessibility options, and more. If you are looking for unique door styles, new colors or even cabinet hardware; the most excellent floors –vinyl, tile, laminate; or countertop alternatives like quartz or granite, call in specialists from Modern Painting & Remodeling for the best experience!